Celebrate adventure: Turn your breathtaking experiences into exciting video clips with music. It's that easy! Select recordings, apply template, and Fastcut does the rest. Import the material from your camera, action cam or smartphone. Select the editing template with music fitting to your material. Share your videos over the Internet via your smartphone, tablet or TV. For the biggest adventure of your life. Free your creativity: With video effects, fades and text – add your own personal touch to your videos. Create your own style with the unlimited options available. A comprehensive Assistant and additional functions ensure beautiful, customized results. Choose from 140 soundtracks and 70 Plus soundtracks – available in any mood and for different durations. You'll find everything you need to create your own video in the shortest time. Decide exactly which favorite moments in your videos you'd like to see in the finished movie. Simply set highlight markers and Fastcut will perfectly integrate them into the selected template. You no longer have to make sure your clip selection is made in the final order. You can change it after the fact by simply drag-and-dropping. No need to set cuts in your own templates by hand – Fastcut does this for you with automatic beat recognition! Would you like even faster cuts and more lens flare? No problem: Edit your templates as often as you like without losing the settings. Now, all changes to individual clips such are cut markers and highlights are automatically saved as a preset for later projects. Would you like to use only a section of your song in a template? Simply trim it to the perfect length. Export your own templates from the program. Afterwards, you can import it to any PC with Fastcut. Thanks to a technical innovation in proxy generation, you'll benefit from smooth previews without any delays. This way you can directly see which template fits your recordings best. 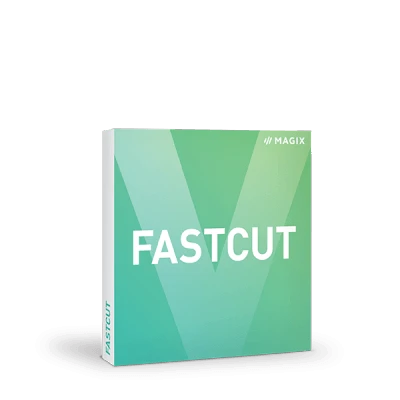 "This package is an easy video editing program, so easy that a single eight minute tutorial gives you all you need to know"
"This is an impressive package and amazing value for $49.99. 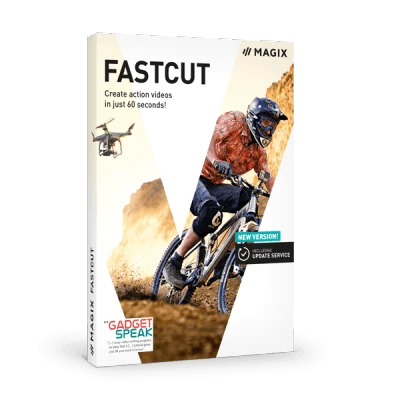 MAGIX Fastcut gets a Gearhead rating of 5 out of 5."